I am now writing at The Lord Geekington (WordPress) and Biological Marginalia (tumblr). I really need to stop doing this. Picture of the Day – Centenarian Box Turtles? A New York Zoological Society photograph, from Oliver (1955). Box Turtles (Terrapene) do not seem like the most likely creatures to live for over 100 years. Compared to Aldabra and Galápagos giant tortoises they’re minuscule (note the human hand in the above photo) and adults have predators, although few are effective (Ernst and Lovich 2009). The hardest data on Box Turtle longevity appear to be from Henry (2003) who documented that individuals of the Eastern subspecies (T. carolina carolina) marked in a 1945 study were still alive. Miller (2001) found that Three-Toed Box Turtles (T. c. triunguis) estimated to be over 60 years of age were gravid and had clutch sizes similar to those of younger individuals. If Box Turtles really do age at a negligible rate as their continued reproduction suggests, this makes the remarkable age claims more plausible. Oliver (1955) noted that while some impossible dates have been carved into Box Turtle shells (e.g. 1492) he argued that some unquestionably demonstrated (somehow…) that the turtles can live 50 to 80 years. 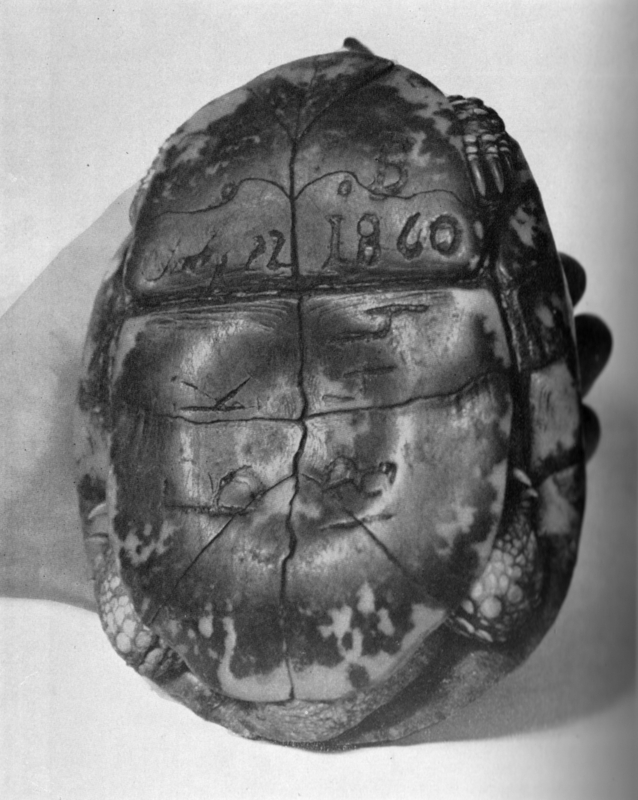 The photograph above is of an Eastern Box Turtle collected in Rhode Island in 1953 with the dates ‘1844’ and ‘1860’ carved into the plastron, implying it was over 100 years of age (Oliver 1955). It is not clear what happened to this individual. 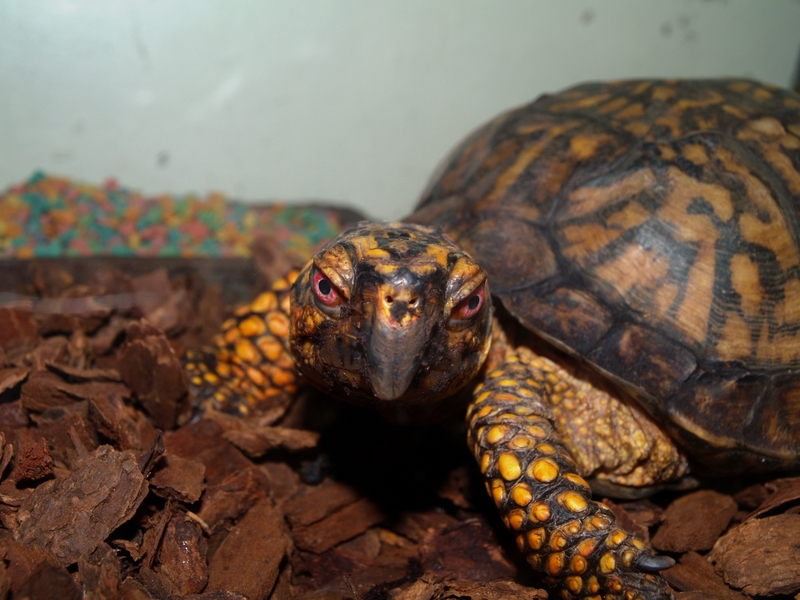 Oliver (1955) credits Eastern Box Turtles with a maximum known age of 138 years, but how this was determined is left unsaid. As for whether or not Box Turtles are abnormal, Congdon (2003) claimed that “evidence for senescence in turtles is weak” and found that Painted Turtles (Chrysemys picta) lived to at least 61 and increased offspring quality with age. I suspect that Box Turtles are not unusually long-lived but rather just easier to mark and recapture. This makes me wonder about some of the turtles I see out basking or cruising on a regular basis, and just how much living they’ve experienced. Congdon, J. et al. (2003) Testing hypotheses of aging in long-lived painted turtles (Chrysemys picta). Experimental Gerontology 38, 765–772. Available. Ernst, C. H. & Lovich, J. E. (2009) Turtles of the United States & Canada. John Hopkins University Press. Henry, P. (2003) The eastern box turtle at the Patuxent Wildlife Research Center 1940s to the present: another view. Experimental Gerontology 38(7), 773–776. Miller, J. (2001) Escaping senescence: demographic data from the three-toed box turtle (Terrapene carolina triunguis). Experimental Gerontology 36(4-6), 829-32. Oliver, J. (1955) The Natural History of North American Amphibians and Reptiles. D. Van Nostrand Company.